These Are Some of the Top Toronto Tourist Attractions! Want to explore Toronto like a local? 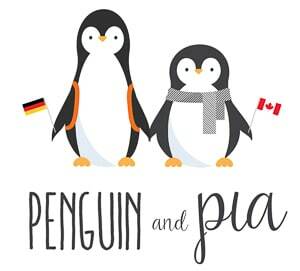 Toss TripAdvisor aside, you got a Canadian right here at Penguin and Pia! Eric is from Ontario and grew up north of Toronto. As for us together, we lived in the city for the better part of a whole year and had amazing adventures in Toronto. Let’s just say that there is certainly no shortage of unique things to do in Toronto when you want to play tourist yourself! We’ve already covered when the best time to visit Canada (and Toronto) is in another post. In short, for Toronto May is great and cooler, July is hot but there are patios, October is beautiful with colours, and January is cold but there’s skating. If you are looking for seasonal activities for the summer for the winter in Toronto, you’ll see below which ones are which! So, if you are looking for fun activities in Toronto for adults, with the kids, or even today, we’ve got you covered. Let’s play Toronto tourist! Oh, and if you planning an entire Toronto visit or you are looking for other places to visit in Ontario – we’ve got lots more about the city and the province! First Time in Canada? Important Need to Know like Visas, Currency, and Culture! Wondering what to Pack? Here’s our Canada Packing List for all Seasons! Here are 9 of our Favourite Coffee Shops in Toronto! Find a Place to Stay with this Toronto Neighbourhood and Hotel Guide! Discover Niagara on the Lake Wineries or Learn How to Rent a Cottage in Ontario! Since there is so much to see and do in Toronto, doing it all will take some planning. 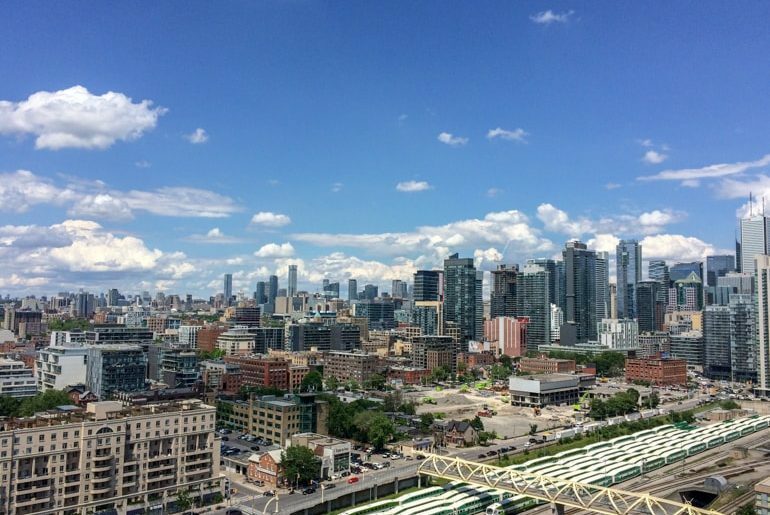 It’s possible to see Toronto in a day – but it would be a busy one! While the city is basically all flat and walkable – the distances between attractions can be a little daunting. You can hop on the TTC (Toronto Transit) by using the streetcars, buses, and subway lines to get around. You can consider buying Presto card (the rechargeable card you just tap) and just loading it with money at a machine. The TTC is actually moving to Presto-only in the near future (early 2019?) so the infrastructure will hopefully be caught up for visitors to easily get their Presto and go. It wasn’t easy in years prior…. trust us. That being said, there are lots of tours that are organized for you to explore the most without planning anything at all. You can go on the classic bus tour of Toronto and buy a hop-on-hop-off bus Toronto tour ticket. These are good for different lengths of time to suit your trip. Another popular way to get around Toronto in by bike – and there are lots of great Toronto bike tours that will show you the way! Biking is actually a great way to get around because Toronto downtown core traffic can be an absolute nightmare. Obviously, bike tours only run in the warmer months but definitely something to consider. You can’t beat a local guide, exercise, and a faster mode of transportation! Finally, if you just want to say screw it and do it all – you can do an ultimate day tour that includes a boat cruise on Lake Ontario. Being able to see the skyline from the waterfront is something that Eric hasn’t even done! But that’s enough tour talk now – let’s dive into the top attractions around Toronto! You’ll notice that they are in no particular geographical order. That said, we did our best to give you the general locations/directions. The views from around the city are nothing compared to up there! The Canadian National Tower (also commonly known as the CN Tower) is like the crown jewel of the Toronto skyline. Built back in the 1970s, the CN Tower was the tallest man-made structure! Standing at 533 metres tall, the views from the top are absolutely incredible. You can see for many miles and even into the United States! Think these views are cool? This isn’t even up the CN Tower (it’s a condo close by)- and this isn’t nearly as high! Once you ride one of the speedy elevators to the main deck, there is lots to do up there! There is a famous glass floor for those brave enough to walk on. The view down to the ground is pretty dizzying. There is a restaurant up there – 360 Restaurant – that is known for serving high-class dishes with local ingredients. The coolest part? The restaurant makes a full rotation every hour so you truly get views of all over the city! The CN Tower is known for the Edge Walk – a thrill-seeker experience of hanging off the edge of the outside of the building. Lastly, you can take the elevator to the Sky Pod – one level higher for views of the city. Comes at an entry cost, though so plan accordingly! Here is the official website for the CN Tower. As a relatively newer attraction to the city’s line-up of awesome things to do, Ripley’s Aquarium has certainly made a splash in a short amount of time. See what we did there? Gotta love our aquarium puns! The Aquarium is home to the longest underwater glass tunnel in North America – it extends through “Dangerous Lagoon”. This is where you come face-to-face with some scary predators like sharks and eels. In all, there are 9 different galleries and over 400 species to check out. You are sure to find something you enjoy! The place is so popular – they recommend visiting before 10 am for after 3 pm to beat the crowds. Pro Tip: If you are planning a visit to Ripley’s Aquarium of Canada and know which day, consider a Ripley’s Aquarium “After Hours” ticket that is valid for a night visit after 7:00 pm. Crowds can be smaller and admission is actually reduced from the daily fare. 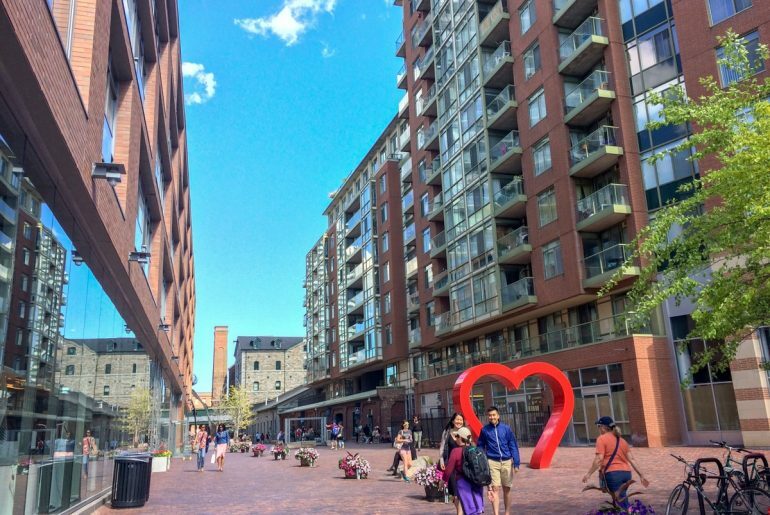 The red bricks of the Distillery District will show you the way! Do you like beer, history, good food, and great photo spots? Great – it sounds like a visit to the Distillery District is for you! Located to the east of downtown, this old industrial area was once the home of many distilleries in the city – hence the name! These days, the odd distillery still exists and is mixed in among the many shops, restaurants, coffee places, and breweries that have moved in! You can do a Distillery District walking tour to learn about the rich history of the red-bricked factories. The Distillery District is full of interesting art installations that draw crowds and make great photographs. In the winter, the District is home to amazing light displays and a winter wonderland of Christmas Market stalls. The District is also home to one of our favourite classic breweries – Mill Street. Known for their Signature Mill Street Organic Beer, you can even sit outside and have a flight of beer for a great price! Pro Tip: If beer is what you are into, Toronto has a crazy vibrant beer scene. You can check it out on a Beer and History Tour of the city. The good news? You’ll end in the Distillery District! You might have heard about this hip and alternative area that you have to walk through? It’s likely Kensington Market – and you should definitely check it out. Kensington is located to the west of Spadina Avenue, north of downtown, between College and Dundas Streets. It’s close to Chinatown if you want to see that too – we mention it below! This urban jungle of graffiti, cool clothing shops, amazing restaurants, markets, almost certainly has something for everyone. You don’t even have to be looking for anything – just a wander through to experience the neighbourhood is enough. You can’t miss things like the Garden Car – you’ll know it when you see it. Trust us. Pro Tip: Kensington is a uniquely old and multicultural neighbourhood with a fascinating immigrant history about it. So, it’s fitting to learn more about the history of Kensington Market through an amazing food tour! Do you like shoes? Like, do you REALLY like shoes? Would a museum full of shoes make you happy? If so, the BATA Shoe Museum might be for you to check out! Located on Bloor Street just north of downtown, the museum has done an amazing job of collecting and showcasing footwear from all around the world. We’ve never been but walked by many many times and always thought it looked super interesting. If you want to visit, you can buy a BATA Shoe entrance ticket here. Here is a shot us of us enjoying the sunny weather in Muskoka chairs at the beach! 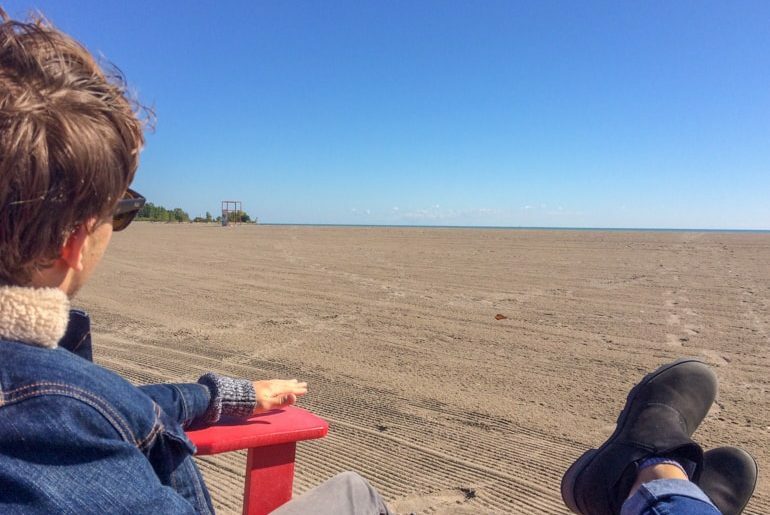 Ah, Woodbine Beach – what can we say? It’s “home”. The beach is located in the neighbourhood called “The Beaches”. The Beaches are in the city’s east end – and it’s actually exactly where we lived for the better part of 2017 when we lived in Toronto! Woodbine Beach is a massive (and massively popular) sandy and rocky beach with access to swim in Lake Ontario. There is a boardwalk that runs for kilometres through Ashbridge’s Bay, other walking trails, parks, dog beaches, and wooded areas. As for things to do, the summertime is busy with paddleboard renters, swimming, sunbathing, a few patios, and beach volleyball. The autumn is great for fall strolls along Lake Ontario. The neighbourhood area along Queen Street East is full of restaurants, bars, and shops that you should check out. It’s funny – the Beaches is where we worked on Penguin and Pia in the early days! How times have changed! The Toronto Sign makes for a great photo opportunity – but you already knew that.. didn’t you? Travelling to Toronto and wanting to snap a photo for Instagram? Of course you do! Head north from Lake Ontario to Nathan Phillips Square. Located at Queen Street West just west of Yonge, it’s here that you’ll find Toronto City Hall and the famous “Toronto Sign”. During the day, the sign of often themed for various festivals or occasions. At night – it’s all lit up! Nathan Phillips Square is quite the gathering spot in the city. At New Year’s, the Square is filled with concert stages and party-goers – Eric has even been a few times. In the winter, the fountain you see in front of the sign turns into an ice skating rink which is free to use (or costs a few dollars for a skate rental). There are street food trucks and lots of tourist buses park here since it’s a great place to start any Toronto sightseeing adventure. Are you into learning about Toronto’s role in military history? Want to learn about how we beat the United States in the War of 1812? That’s a true story – and you can learn all about it at Fort York. The grounds are located to the west of downtown – pinched between the Lake and Liberty Village under the Gardiner Expressway. The historic site is actually one of the largest collection of 1812 Wartime buildings. They even have cannon firings and daily tours that run frequently. Some of the park ground are free to roam through but the exhibits and museums are entered for a fee. To learn more about visiting Fort York and the exhibits, visit the official Fort York website. The St. Lawrence Market is definitely a must-see if you are visiting the city. We visited the Market “playing tourist” when Lisa was visiting before she moved to Canada and it was an amazing experience. The current building where it is located was opened in 1902! Inside, there are two floors – the main floor stretches the length of the main hall and the lower floor is just a portion of the length. You’ll find a selection of fresh produce, fresh meats and seafoods, cheeses, prepared food, wine, trinkets, you name it! There are samples at various counters and places to grab lunch so you definitely shouldn’t leave hungry. If you are looking for very tourist Canadian souvenirs, there is also a place to buy them here. You can learn more about the Market and the area of Old Toronto on a historic food and Market tour of the area! Pro Tip: -The Market is located just to the east of downtown on Front Street – and you can check out The Gooderham Building for a great photo. The Gooderham is that historic red-brick flatiron building at the intersection of Wellington Street and Front Street! Looking to get away from the hustle and bustle of downtown Toronto? Check out the Toronto Islands – that might help! Located in Lake Ontario just off the shore across from downtown, “the Islands” as they are known are popular for their beaches, walking trails, and the historic Centreville Amusement Park. The Islands themselves actually have inhabitants – and to get to them there is a ferry that leaves from the Ferry Terminal located on Queens Quay between Yonge and Bay Streets. You can check out the Toronto Island ferry schedule here. 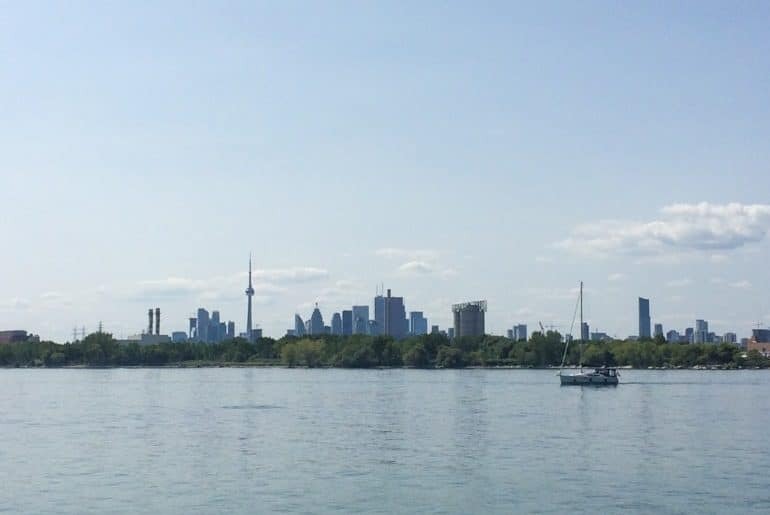 Alternatively, if you want a smaller tour of the harbour and surrounding islands, check out this Toronto Harbour Boat Cruise. You have to get off on the islands so the tour doubles as a water taxi – and amazing photos of the skyline are basically guaranteed! All aboard the Steam train… to Steam Whistle Brewery! Located very close to Ripley’s Aquarium, the CN Tower, and the Rogers Centre, Steam Whistle has been a tourist magnet and popular brand in Toronto and Canada for two decades. Founded back in 1998, Steam Whistle finds its home in the Roundhouse – an old red-brick railway repair depot used back in the day. These days, you can tour the brewery or just belly up to the bar for a pint of the classic pilsner that has made them one of the most well-known beers in Canada. To check out the Brewery or to book a tour, check out the official website of Steam Whistle. It’s a house? It’s a castle? No, it’s Casa Loma! Built in the early 1900s and located in Toronto’s midtown, Casa Loma is a top tourist attraction for so many reasons. This Gothic dream home was built by a wealthy Toronto businessman – Sir Henry Pellatt. After decades of history, the estate is now owned by the city and revered for its many art pieces and rich history. Because of the grand size of the estate and gardens, Casa Loma is also the place for many events, festivals, and even weddings throughout the year. If you are visiting, you can buy a ticket to enter and hop on a guided tour to learn all about one of Toronto’s most famous attractions! Here is the official Casa Loma website! The Art Gallery of Ontario (or AGO, for short) is located on Dundas Street West between Spadina and University Avenue and is definitely an art lover’s paradise. Featuring 95,000 works over 45,000 sq metres of space, this makes the AGO one of the largest galleries in all of North America. The AGO was originally founded in the year 1900. Over the years, it has seen expansions to the current size and number of galleries. The AGO hosts exhibitions and has many permanent galleries featuring everything from Canadian artwork to African sculptures to Baroque-era paintings. You can learn more here at the official AGO website – keep in mind the AGO is closed on Mondays! You can’t go to Canada and not discover the rich history of hockey! So, you should take a trip to the Hockey Hall of Fame! Located downtown on Front Street, the Hockey Hall of Fame is a great museum/exhibit with tons to do and lots to learn about. The coolest part is that you will be able to see the Stanley Cup (the biggest trophy in hockey and one of the oldest sports trophies in organized leagues worldwide). Eric went as a kid many many times since it was always a great place for a school to plan a field trip to. That said, there is plenty to do for adults as well. Hockey is a huge part of Canadian culture and so a stop by is definitely worth your time! You can learn more at the official Hockey Hall of Fame website. If you are looking for the “Times Square” but for Toronto – Dundas Square is it. From the street performers to the lights at night, the corner near Yonge and Dundas is a great place to experience Toronto in full swing in the evening. Besides malls and restaurant, there isn’t much to do there, but you would certainly pass through to snap a few photos in the evening! It’s probably good to mention that the southwest corner is where you enter the Eaton Centre – a top attraction but not good enough for its own place on the list. It’s just a very nice mall that is pretty big and features some very popular shops. There are fountains and at Christmas, they have a tree and giant reindeer! The Royal Ontario Museum (the ROM, for short) is located at Bloor Street and Avenue Road and has a history of displaying just a little bit of everything! However, this makes sense – the ROM is the largest (and most visited) museum in Canada and one of the largest in North America. With around 6 million pieces, the numerous galleries and exhibits feature things from spiders to art, culture to dinosaurs, and Rome! Eric went as a kid years ago and remembers having an amazing time at the ROM! If you are getting there by subway, you can get off at – you guessed it – Museum Station! Pro Tip: You can buy a ROM General Admission ticket in advance here if you choose! 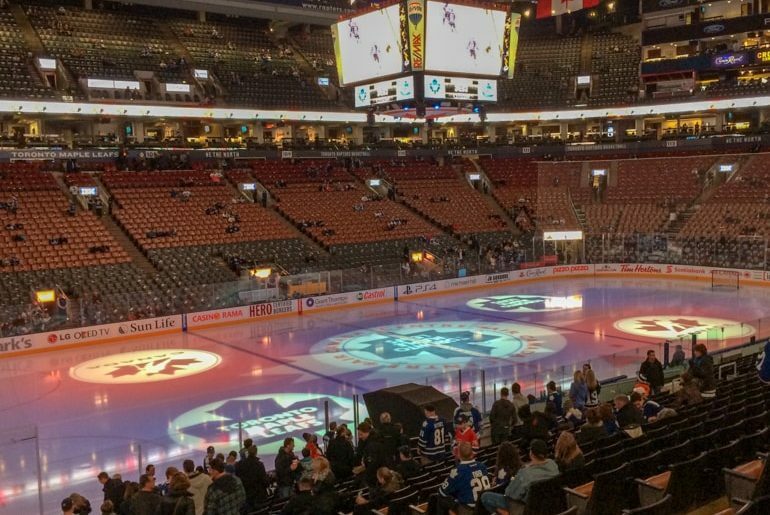 Inside the Scotiabank Arena when it was the Air Canada Centre before Lisa’s first Leafs game! If you are into sports, Toronto is an amazing sports city with very passionate fans across the professional leagues. At the Scotiabank Arena (formerly called the Air Canada Centre) the Toronto Maple Leafs play ice hockey and the Toronto Raptors play basketball. The Arena is located closer to the water, just south of Union Station. Leafs tickets can be very expensive but are definitely worth the experience of watching professional level hockey in Canada. Raptors tickets can be less expensive if you don’t mind sitting farther up in the stands! Even watching the game in any of the sports bars nearby is an experience worthy of a visitor to Toronto! Here is the Scotiabank Arena website if you want to check out ticket availability and prices. There are many amazing Chinatowns around the world (San Francisco, for example) – and Chinatown in Toronto is no exception! If you want to experience Chinatown in Toronto, head over to Spadina between College Street and Queen Street West. You’ll find open-air shops with all sorts of goods, amazing restaurants (with really good dim sum), and other places to grab sweet treats. Chinatown itself is a neat experience and conveniently placed along Spadina. This makes it easy to wander through on the way to another attraction. Toronto is a city that prides itself on its multiculturalism and ethnic diversity so check it out! Go Jays Go! At Lisa’s first Jays game. 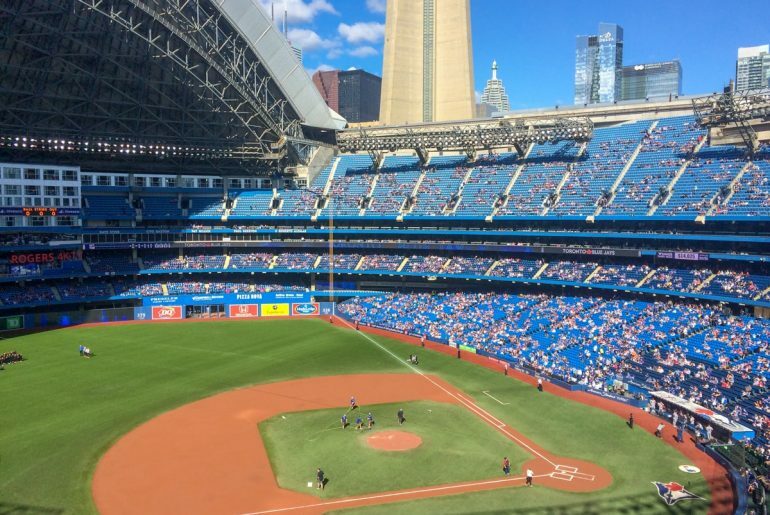 When the Rogers Centre roof is open – you know it’s a nice day! Still thinking about sports? How about catching a baseball game? The Blue Jays play at the Rogers Centre – located physically at the base of the CN Tower. The Jays are the only Canadian team playing in Major League Baseball so if you’re in Toronto anytime from April to September, Toronto is your only chance to catch baseball north of the border! The nice thing about Jays games is that the summer weather means a great time out in the sunshine. The other great thing about tickets at the Rogers Centre is that that they are still relatively inexpensive. You can go to a game for cheap and enjoy the game from decent seats! Unlike at Scotiabank Arena, you can show up on game day, wait in line, and get tickets! It’s a franchise that isn’t too expensive yet (cough, the Leafs). Here’s the Jays website for tickets. Queen Street West is certainly where you can get some shopping done! Located – you guessed it – along Queen Street West west of Yonge Street and extending well past Bathurst Street, Queen Street is also home to many amazing restaurants, hip bars and pubs, and coffee shops. One of our favourite ramen places in on Queen Street West and Lisa misses it dearly from when we used to go for ramen lunch! Mmmm, noodles. Just down the boardwalk, you can see the ships and other attractions at the Harbourfront. If you are looking for things to do down near the waterfront, head to the Harbourfront Centre! The Centre itself is actually an area of the pier described as a “cultural hub”. This means that there are walking paths, performance stages, exhibits, restaurants, coffee shops, and much more. There is always something going on down at the Harbourfront Centre. You can get great photos down by the lake, and the proximity to Amsterdam Brewhouse is also nice! Learn more about what’s on at the Harbourfront Centre at the official website. As one of the oldest universities in all of Canada and the oldest in Ontario, the University of Toronto has a great reputation on the world stage for academics. Founded in 1827, the main campus (St. George Campus) is often like stepping into a time capsule. This university has a massive main campus that sprawls for blocks and blocks between College Street and Bloor Street. You can walk through, hop on a campus tour, and you might even find football going on at their Varsity Stadium! 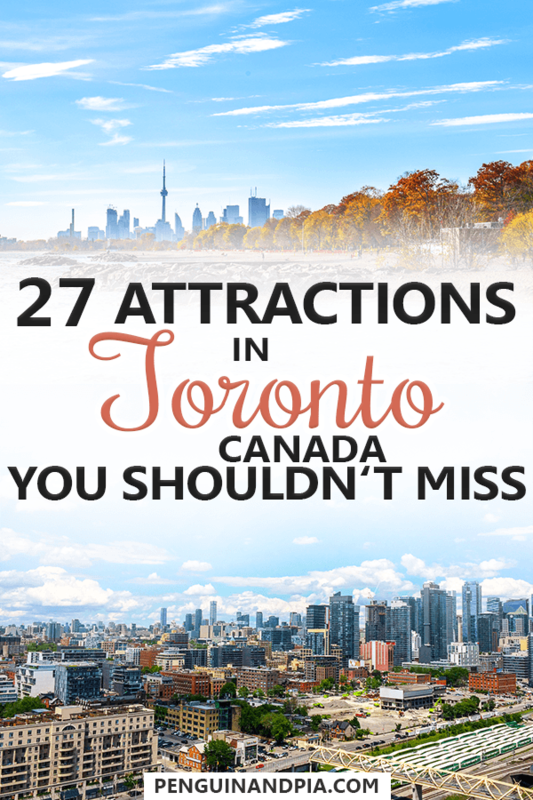 While this article is about Toronto tourist attractions that are mainly located downtown or very close by, the reality is there are a handful of awesome attractions that you might be interested in checking out! So, here are five. We want to make it clear: these are NOT in downtown Toronto. It would be in your best interest to have a rental car to reach these attractions given their distance. That said, you’d definitely consider these on a weekend trip in Ontario if you’re up for it! Located out in the north end of Scarborough, the Toronto Zoo is renowned for its number of species – over 5,000! The zoo itself is divided into 7 “areas” what showcase all different climates/regions where animal groups exist in the wild. The Toronto Zoo was originally opened in the 1970 and today enjoys very high visitor numbers because of their commitment to research and ecological sustainability. You can learn more about directions and admission prices at the official website of the Toronto Zoo. Remember the Beaches? This is Ashbridge’s Bay – and the Bluffs are even further from downtown. Just for your reference! If Woodbine Beach and the parks in that area weren’t enough, you could drive out to Scarborough (far east of the city). Along the water’s edge, you’ll find large white cliffs – these are the Scarborough Bluffs. The cliffs draw in a number of visitors to the nearby parks and beaches in the summer. Notably, you can plan a visit by heading for Scarborough Bluffs Park Beach or Bluffer’s Park Beach. Wonderland is the biggest and best amusement park in the country. Located about 40 minutes north of downtown Toronto, Wonderland features roller coasters that crack numerous top 10 lists in the world for tallness or speed, among other things. Just Google “Leviathan” – it’s the tallest in Canada and the 9th tallest in the world! Eric grew up about 20 minutes north of Wonderland and so as a kid (and as a teenager, too) he would go to Wonderland on summer evenings when the crowds had died down. You can also go in the spring or fall at reduced hours. These days, the place is busy and expensive – but definitely worth it if you like thrills and decent attractions. Check out the official website for Canada’s Wonderland! Want to be entertained and learn a little bit, too? The Ontario Science Centre is where you should go! Located to the northeast of the city along the Don Valley Parkway in North York, the Science Centre is known for the featured exhibits, interactive science displays, and IMAX theatre. They even have a rainforest area which is climate controlled to help grow different plants to discuss ecology. All in all, the Science Centre is a great way to kill a few hours or entertain the kids if you want more ideas! Check out the official website for the Ontario Science Centre for directions and prices! Let’s be clear – Niagara Falls shouldn’t be on this list because it’s not “only a 45 minutes drive” from Toronto like the others. Niagara Falls is about 2.5 hours from downtown Toronto, traffic depending. So, if you want to explore Niagara Falls, you can book a Niagara day trip from Toronto to make things easy if you didn’t plan on heading down on your own. And there you have it – 27 of the best Toronto tourist attractions that are out there! Obviously, there are a few things that we didn’t mention – but those “hidden gems” are for another post. Toronto is an amazing city, a place we also call home, and a welcoming city for people of all backgrounds, colours, and languages! We’re confident that you will have an amazing time exploring Toronto when you visit! Have you been before? What did you get to see or what did you miss? Get in touch and let us know!